Spring has sprung (well, almost), and it’s time to start digging! Save the date and join the army of over 200 Women Build Volunteers as we break ground for the foundation of the 10th home sponsored and built by Flower City Habitat for Humanity Women Build volunteers. 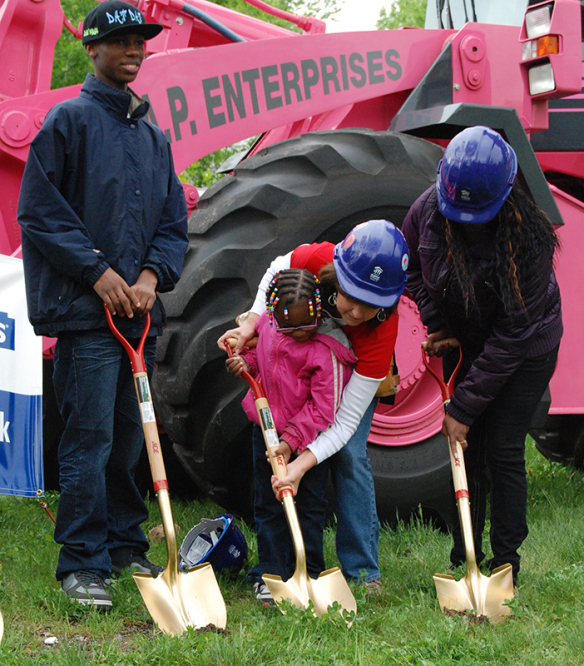 The groundbreaking ceremony is the official KICKOFF for the 2014 Women Build project and celebrates the first day of construction. It is the first of three major milestones in the building of the Women Build home. The second and third are the Wall Raising in June and the Dedication in August or September. Each milestone represents a time for celebration and reflection of what’s been accomplished, and what lies ahead. It takes 77 days to build a house, and this is Day #1!! Please come and grab the ceremonial gold shovel and help with the dig, meet the family and other volunteers! This also means that you and your teams can start signing up NOW for Build Days, with Tuesday, May 13th as the first official build day. Check out the schedule on Volunteer Up!, Flower City Habitat for Humanity’s online volunteer management system. 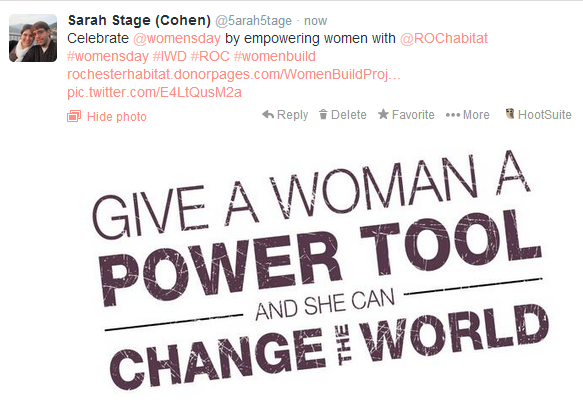 GIVE A WOMAN A POWER TOOL AND SHE CAN CHANGE THE WORLD!! Our slogan is “Give a Woman a Power Tool and She Can Change the World.” That’s a pretty powerful message, but any message can only go as far as it is heard. That’s where social media comes in. Think of it as your loud-speaker to help get your message heard by as many people as possible. 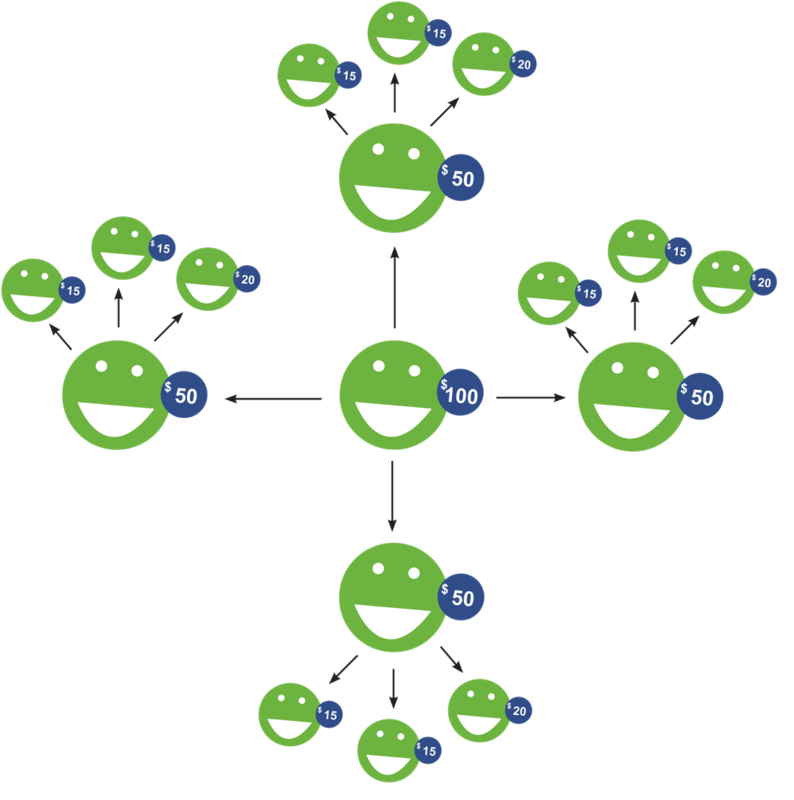 In this example, a $100 donation becomes $500 through the power of engagement. Want to get started, but don’t know how, or feel like you need some ideas? That’s why we’ve created this handy Social Media Guide full of examples and step by step instructions on how to use Facebook, Twitter and Instagram to help amplify your Women Build involvement. Did you know that tomorrow (March 8th) is International Women’s Day? This day has been observed since the early 1900s to celebrate and recognize the achievements of women across the globe, from women’s suffrage to competing in the Olympics. To learn more about the history of International Women’s Day, click here. 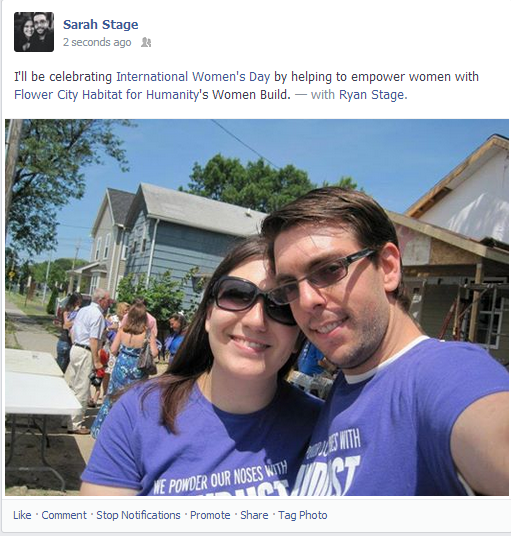 As a celebration of the Flower City Habitat Women Build commitment to empowering women, we’re asking that you share your favorite photo or story from your Women Build experience on Facebook or Twitter. Be sure to like & tag both organizations!